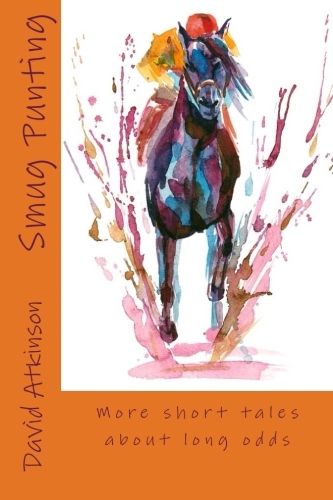 On checking out of the Hotel Ayre (pronounced aye-ree, I discovered from a chuckling taxi driver, speeding us northwards at impossible speeds through skinny alleyways) I became convinced that the hotel manageress had the hots for me. Understandable of course. Overly smiley eyes catching mine unnecessarily and keen attention to my needs. Classic signs. I’d noticed these traits on checking in and had been trying to convince Mrs A about her designs throughout our stay. We planned to leave Cordoba by mid-afternoon after a second rendezvous with Daughter No 1’s Spanish exchange counterpart, Ana and her Mum. This involved spreading out under cedar trees, revising our Spanglish of the previous evening and eating ice cream. The Hotel Manageress came out to the pool bar regularly and I was disgusted to see that she had a furtive smile, wave and wink for nearly every cluster of sun-lounging guests. Tart. 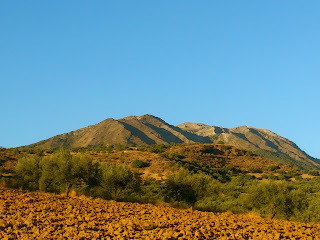 Driving to Vinuela took just under two hours through much more undulating countryside than north of Cordoba. 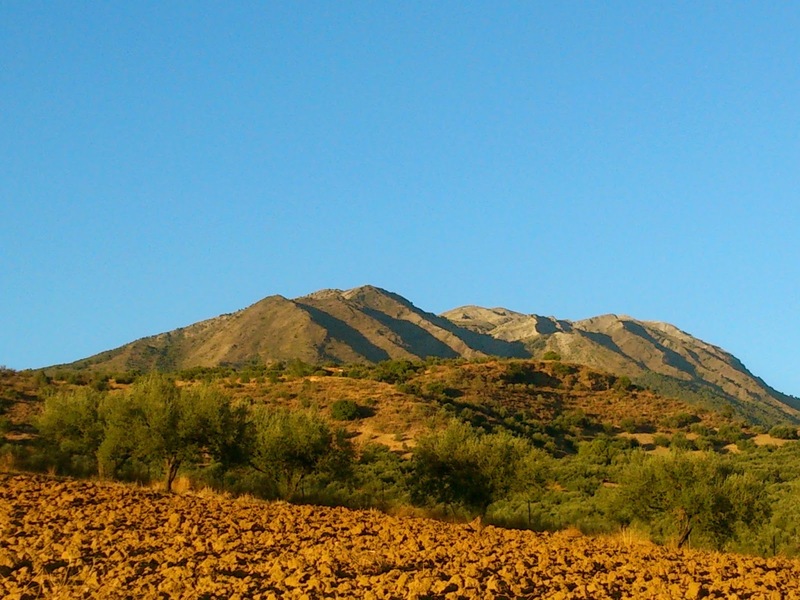 The peaks and troughs were mostly cultivated with olive groves or vines. The land was so hilly that irrigation seemed to be through a network of sprinkler tubes on the ground, rather then the tubular, wheeled rigs we had seen up country. We immediately noticed the temperature difference nearer the coast. It was less suffocatingly hot and muggy here, in the foothills of the sierras. 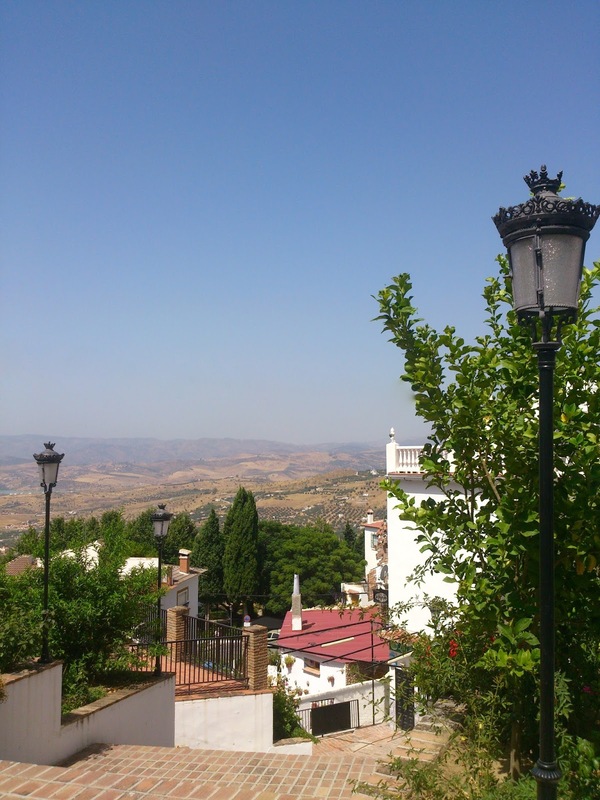 Cordoba felt like (even if it actually wasn’t) about the hottest place I’d ever been. I’ll never forget the sight of people picnicking in the parks at 1.30am in the morning as if it was the middle of the day. Extended Cordoban families on fold-up chairs, gathered around towering cool boxes whilst their children played on swings and booted footballs around. The only time of day that such activity was possible. Our apartment was situated about twenty miles from the coast between two very different villages. The nearest, Puente de Salia was a mixed community of mainly Spanish but with a significant English presence and a sprinkling of Germans. 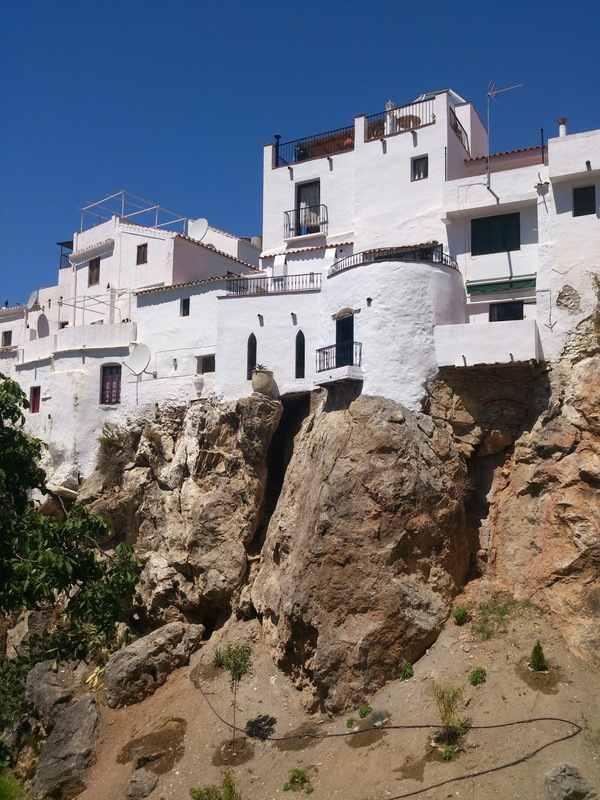 The village had a core knot of Spanish houses and a few shops, but most of the development was new and in the typical urbanization style of small villas and houses with pools clustered into small on cul de sacs. 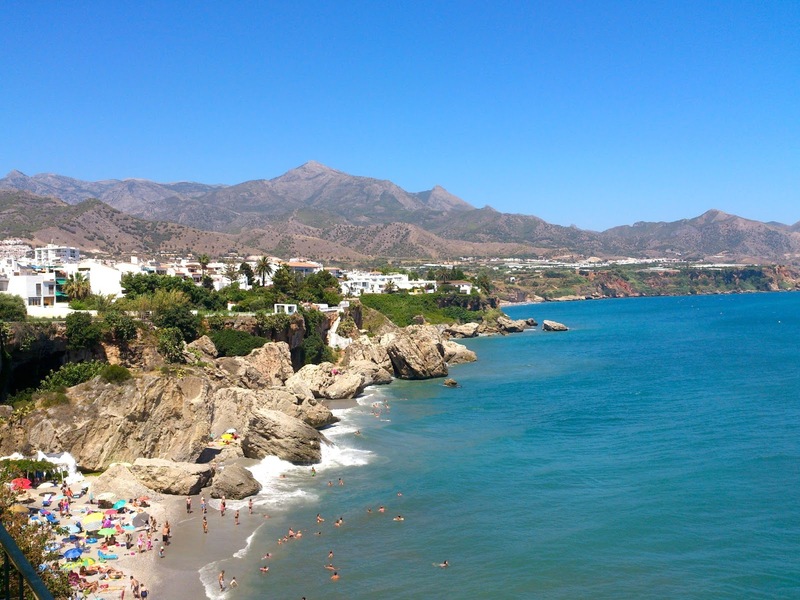 Costa De Sol-ism had been creeping up into the hills of the hitherto untouristy Axarquia region for some time, propelled by the noughties property boom and the fact that pretty much everywhere else near the coast had been swamped. The invasion had halted rapidly with the property crash a few years ago. The straggling village had at least half a dozen unfinished developments around the place. 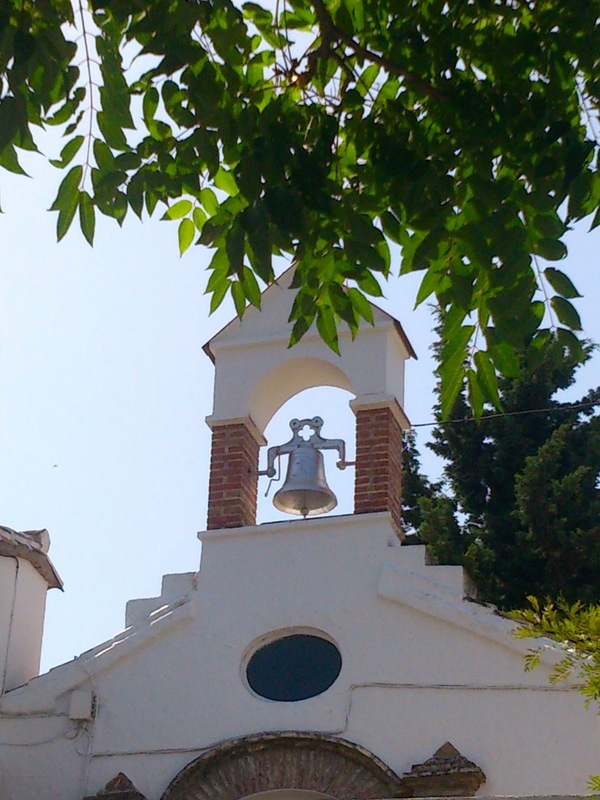 La Vinuela was the opposite. The village had maintained its Spanish feel and consisted of one main road dropping down a steep gradient with the now familiar Moorish twists, turns and deviations. Many of the houses dated from the last century and the main inn of the village, La Venta La Vina, was originally a calling point on the coast to Granada route. There was no sign of urbanization boom-and-bust here at all. Indeed the village seemed quite affluent. Well kept two- and three-storey houses tumbled down the hill. 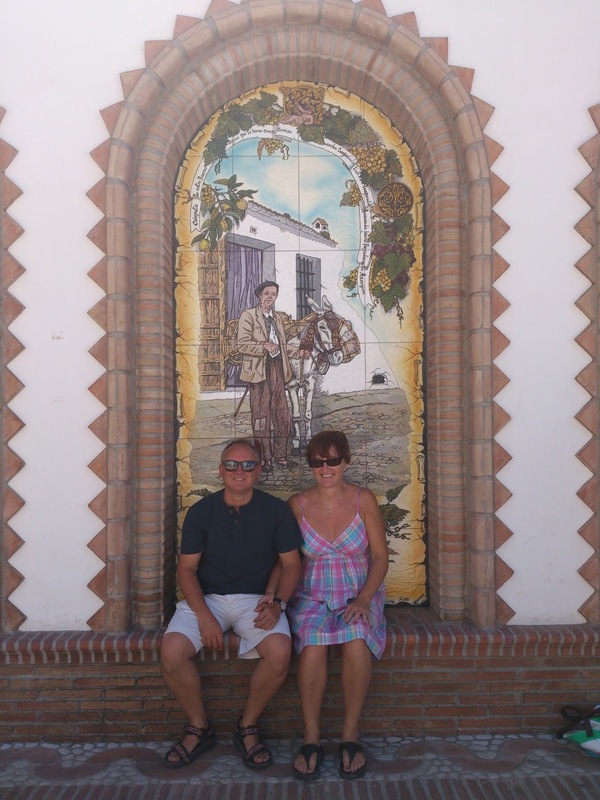 Scattered in between – in typical Spanish style – was the bakery, the grocer, the supermarket, butcher, chemist, post office, bars and restaurants. Not much crowding around a village centre as we are used to in England, but straggling the entire length of the road. The apartment itself was pretty good – private-ish and quiet-ish. The qualifications revolved around the proprietors of the apartment who lived upstairs. Although our abode was self-contained, Steph did like to pop down and say hello from time to time. On one occasion wrapping an orange polystyrene tube around her middle, tip-toeing in to the pool and saying, “you don’t mind if I have a float do you”. I hate floaters in my pools. She evidently didn’t like the Spanish or their culture very much. We were recommended all the English supermarkets and bars in the area, including a curry house and chip shop. Her intrusions, to be fair, were mercifully isolated and brief. 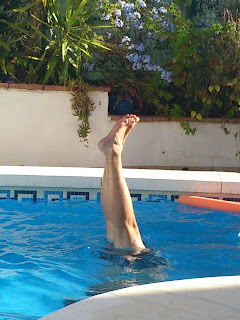 The pool was fantastic and the non-English tapas bars and restaurants were plentiful and excellent. In one place, Daughter no 1 demolished a huge dish described as ‘plate of the mountains’ which included at least four different pig-based products, one of which was a delicious distant relative of the humble black pudding. The noise of the cicadas was curious. 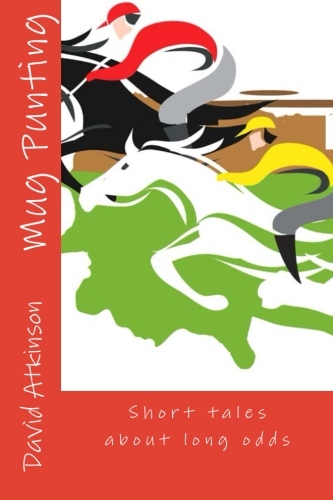 We noticed strolling around the lanes how their volume ratcheted up several notches the moment the sun dipped behind a rare and threatening cloud, as if they were anticipating the onset of evening. Only to fall near silent when the sun cranked up to Regulo 11 again once it had burnt off the cloud. Later, by the pool, Daughter No 1 thought she had discovered an unsuspecting cicada in a plant pot and went for a closer inspection. It was, in fact, the more prosaic sound of a garden sprinkler. Maybe we should get her ears tested. The next day she claimed to be hearing a game of table tennis nearby. It was the ticking of the kitchen clock. Meanwhile daughter no 2 was almost overcome by the cheap Chinese bazaar up the road. Not only did she indulge in bargain basement bikinis, sunglasses and bracelets, but spent many long moments deciding how many and which flavour combinations of 5-cent chewing gum she could purchase with the sorry remnants of her holiday stash. When we could forcibly eject the girls (and ourselves) from the pool, we got out to explore a few of the other villages and towns in the foothills of Mount Maroma and the Tajeda, Almijara and Alhama hills. Driving through the chunky scenery I was reminded of spaghetti westerns, many of which were filmed in the Spanish sierras. With my healthy five-day growth of facial hair, I turned to daughter no 1 and remarked how much like a tough cowboy I must look in this environment. “Hmm. More like a homeless person”, she said, without a second’s thought. 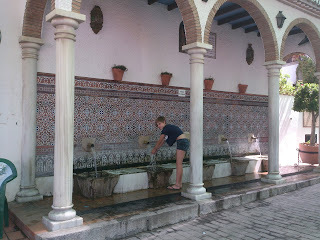 Most of the pueblo blancos have ornate and attractive public fountains drawing icy water direct from the mountains. Those in Alcaucin are the centrepiece of the tiny main street. Whilst munching on tuna tostas we saw a van draw up and two blokes fill up about 30 five-litre bottles from the fonts. Later to be labeled and sold on as mineral water, Del Trotter Peckham Spring-style, I wagered. Periana has some Roman baths sourced from the mountain that are currently being restored. 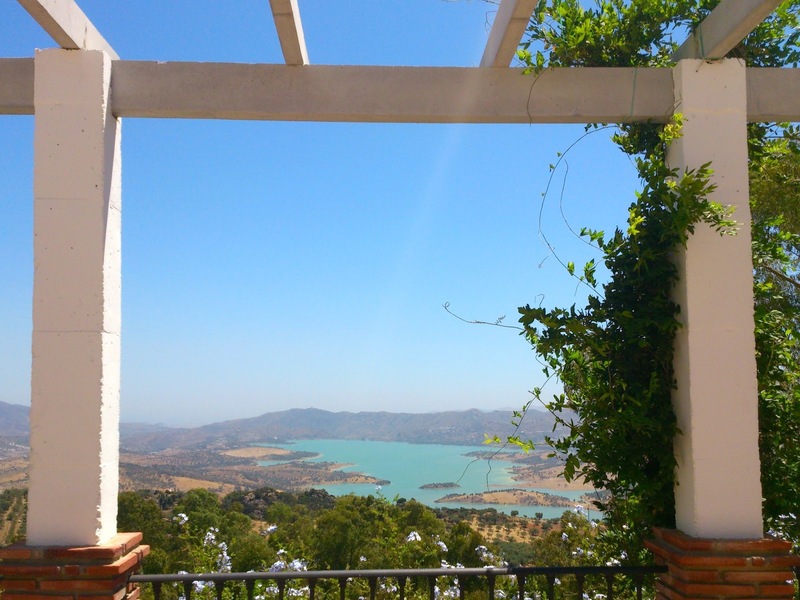 That town has an incredible view of Lake Vinuela, the reservoir that lies only an easily-skimmed stone from our apartment. We didn’t time our visit there particularly well, in the searing afternoon heat, but it was still surprising that there were few public facilities and no bathers, boaters or windsurfers. 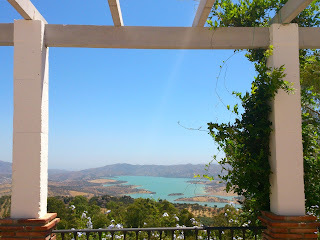 The lake is in a magnificent natural setting and the colour of the water reflects a translucent turquoise. Before we arrived I’d read some unsubstantiated stories about pollution here and so maybe the rumours have done their worst. Compared to the state of the Med just down the road, I would have thought this was a much more attractive opportunity. We ventured to that coast at least twice. The first trip was by accident on the first day when we missed the turning for the village centre and Mrs A didn’t fancy turning round on the windy old road. “Let’s go to Torre”, she said. “What? Really?” I exclaimed. I didn’t have a single one of my many maps or guide books about my person, let alone a detailed and annoted google earth route-plan print out. “Madness!” I declared, feeling naked and vulnerable. By luck and good judgement, we found our way to Torre and eventually to a car park. The beach was horrendous. The frothy, yeasty sea gave way to black sharp-sand, forested with impenetrable rows of gaudy umbrellas and towels. 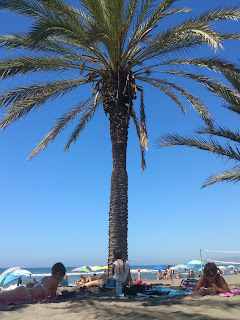 The beach was backed by the well-documented high rise holiday hell of hotels and apartment blocks right into Malaga and beyond. Looking east, the horizon was a bit lower profile and over a salad drowning in cheap vinegar, we resolved to explore that way at some later stage. Guide books do lie, after all. The coastal strip east of Torre Del Mar was still pretty rubbish, despite claims that there existed quiet coves with just the odd restaurant and bar. To be fair, some of the development was fairly new and if I’d not been such a cheapskate as to buy an out-of date guide from a second hand book shop, I might have known. 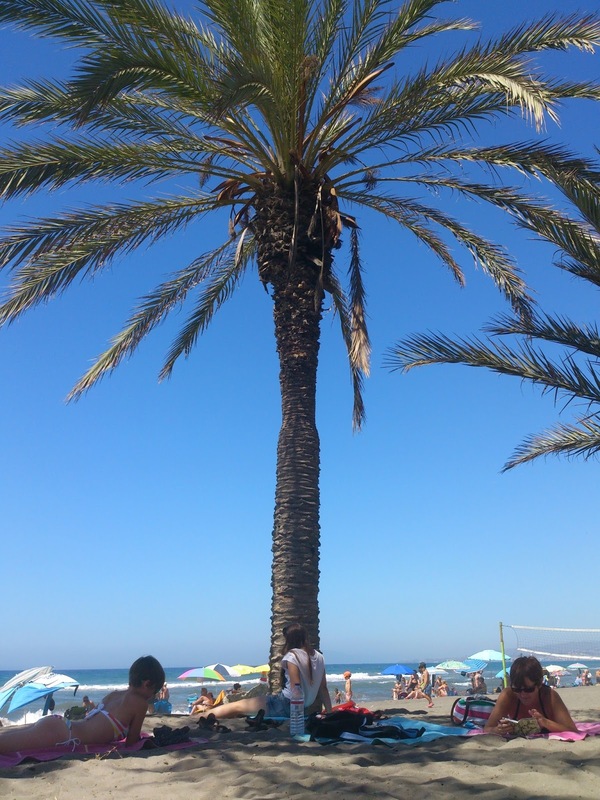 We persevered and found a half decent spot to ourselves under some palm trees. Daughter no 1 and I did a sterling hour’s battle with a frisky Mediterranean surf in which I lost my sunglasses and found hers. And we both fell over lots. The decent coastline was finally located at Nerja, a gorgeous town at the end of a green, hilly promontory with rocky coves, better sand and good solid geography all round (Rah! Rah!). Ice creams on the gloriously monickered Balcon De Europa were a fine end to the day. We are packing up now, rested and chilled, for the final part of our Spanish trip back inland again to the Sierra Subbeticas National Park. 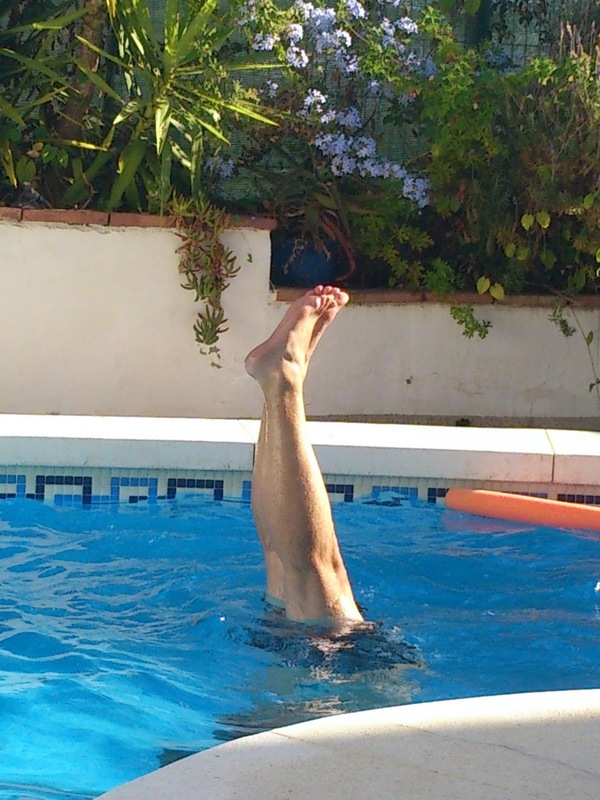 I’ll see if anyone there can relieve me of my 'best pool handstand' award (self-certified).